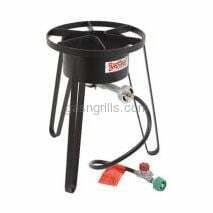 Features: 12" Welded Steel Frame with Flame Spreader. 14" Diameter Cooking Surface. 48" LPG Stainless Braided Hose. 20 PSI Preset Regulator with Brass Control Valve. 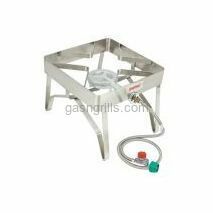 Features: High Pressure Burner. 13" Welded Steel Frame . 14" Diameter Cooking Surface. 48" Stainless Braided Hose. 20 PSI Preset Regulator with Brass Control Valve. 360° Windscreen Protection / Wide Leg Design for Stability. 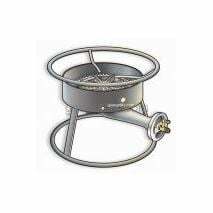 Features: 13" Tall Heavy Duty Steel Frame. 16" x 16" Large Cooking Surface. 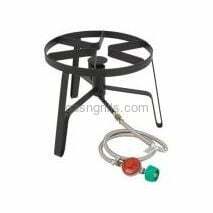 6" Cast Iron Fry Burner. 36" Stainless Braided Hose. 10 PSI Adjustable Regulator. Accommodates Any Size Stockpot. 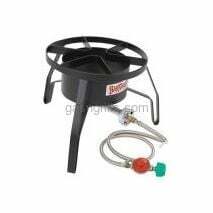 Features: High Pressure Burner. 21" Welded Steel Frame. 14" Diameter Cooking Surface. 29" LPG Rubber Hose. 10 PSI Adjustable Regulator. 360° Windscreen Protection. 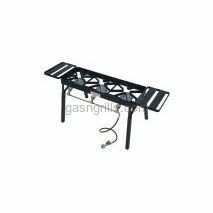 Features: 10" Cast Iron Burner. 17" Large Cooking Surface. 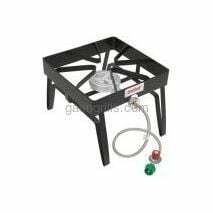 Designed to Safely Support Large Cooking Pots. 48" LPG Rubber Hose. 30 PSI Preset Regulator with Brass Control Valve. 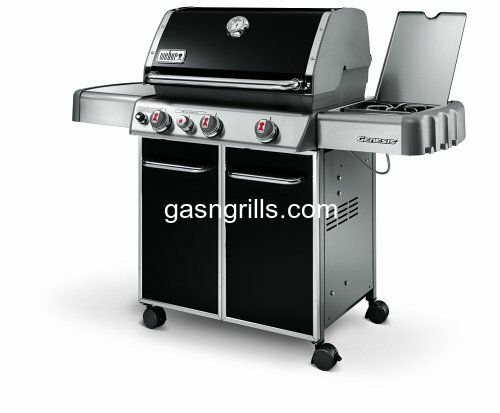 Features: 13" Tall Heavy Duty Stainless Steel Frame. 16" x 16" Large Cooking Surface. 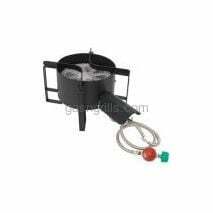 6" Cast Iron Fry Burner. 36" Stainless Braided Hose. 10 PSI Adjustable Regulator. Accommodates Any Size Stockpot. 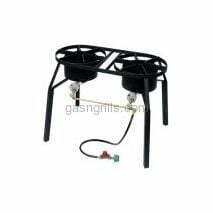 Features: 13" Tall Heavy Duty Steel Frame. 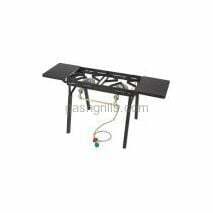 Extension Legs raise Height to 25". 14.25" x 39" Large Cooking Surface. Two Side Shelves extend width to 60.5". Three 6" Cast Iron Fry Burners & Brass Control Valves. 36" Stainless Braided Hose. 15 PSI Preset Regulator.